Australia’s two richest residents, Gina Rinehart and Andrew Forrest, were busy adding to their contacts list earlier this month at the Boao Forum for Asia, the Asian version of the World Economic Forum. The pair owe a lot of their success to investors in the region. Rinehart’s Hancock Prospecting got a multi-billion dollar capital injection through South Korean steel company POSCO and Japanese trading house Marubeni Corp for the development of the Roy Hill iron ore mine. Similarly Forrest benefited from early investments by high-profile Malaysian investor Kie Chiw Wong and it’s through these contacts that Fortescue Metals is able to crack profitable business deals in Asia. But while they were active, there was only one Australian government representative at the event. The growing wealth of Asia not only creates opportunities for the resources sector, other members of the BRW Rich 200 in different industries are also benefiting. 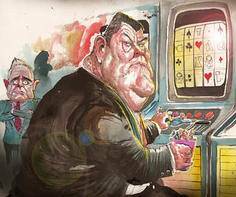 James Packer expanded into the Asian gambling industry after selling off 50 per cent of Publishing & Broadcasting Media. Through a joint venture with Lawrence Ho, also the son of a casino tycoon, Packer set up Melco Crown Entertainment and now has stakes in the Altira and City of Dreams casinos in Macau. This success has led to plans for a third casino resort, Macau Studio City, which is set to begin construction next year and a possible $2 billion casino development in the Philippines. Packer’s investment in Asia has been hugely successful, with the company reporting a 550 per cent increase in fourth-quarter earnings in 2011. In contrast, Packer’s Australian casino operations are expected to yield earnings growth of a paltry 4.7 per cent over the same period. Greg Goodman is another Rich lister busily tapping into the Asian growth story. Goodman Group is Australia’s largest industrial and commercial property manager and a leading logistics developer. One of the top three industrial property developers in China, Goodman Group is deriving a larger portion of its revenue from the region. The company is in the process of developing a Hong Kong base to better manage its business and expand. The Kirby Brothers, who made their fortune through Village Roadshow, are eyeing the Asian entertainment industry. They hold investments in the Chinese film and music industry and are looking at opening theme parks in the region. You’d think that given the level of interest the Australian Taxation Office pays to rich listers like these, the Department of Foreign Affairs and Trade might also take a little more interest in the next Boao Forum.